The 20mph debate rages on in Bristol, with murmurings of potential reversal, Bristol Cycle Campaign want to shed some facts on an important aspect – Energy and Emissions. We’ve even got a handy infographic. 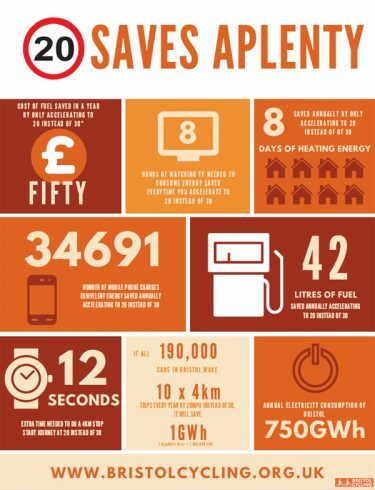 One controversial argument often heard is that a vehicle travelling at 20mph has higher fuel consumption and emissions than at 30mph. Whilst it is true that the gearing on most passenger cars means that traveling on an empty motorway at 20 instead of 30 would use more fuel for the same distance, the same is not true in urban areas. Even during uncongested times these roads have junctions and traffic lights. It is almost impossible to safely navigate a city without stopping and starting. Take a 4km journey with 7 stops 500m apart. A car accelerating to 30mph from one stop to the next at a steady rate of 5mph per second would take 6 seconds to reach 30mph, it would then cruise at 30mph for 31 seconds before braking for 7 seconds. The 6 second acceleration phase uses over twice the amount of energy as the 30 seconds at steady speed. The braking phase then wastes all the energy. If the car weighs 1384kg, the average weight of a passenger car in the EU, has a drag factor of 1 and is 25% efficient, the overall energy consumed is 2.2 kWh. If the speed limit on this road was 20mph instead of 30 this car would consume 1.4 kWh. A common argument against 20mph is that it is difficult to stick to. As most passenger cars are optimised for driving on empty country roads and can reach speeds far in excess of any national speed limit, it is not surprising sticking to 20 is tricky. However, if air pollution and climate change are considered important, the solution is to surely change the vehicles we are using to move around the city. Yet the trend is still for bigger and heavier cars. Take the journey above, the raw energy needed to shift an average 77kg UK resident, with no steel cage, is 0.11 kWh. Doing it on a 20kg bike uses 1.1 times this energy (0.12kWh), in a two seater electrically powered light Renault twizzy, this figure is double (0.2kWh), in an average weight and average aerodynamically efficient petrol powered vehicle it is 20 times this. In an SUV it is nearly 30 times (3.31kWh). Some newer cars now have adjustable speed limiters that can be set to a specific speed and make it harder (but not impossible) to exceed it. Another emission source rarely considered is non-exhaust emissions. These originate from tyre, brake, engine and road wear and contribute more than exhaust emissions to particulate matter pollution in our cities. Basically, the greater the force exerted on the tyre, brake, road or engine, the greater the wear rate. Reducing vehicle weight and speed limits reduces wear and tear, reducing particles in the air and reducing the number of times you need to change your tyres, brakes, engine components and the amount of tarmac that goes to landfill (unlike rail tracks you can’t recycle tarmac). These particulates are one of the main reasons tens of thousands of tonnes of autumn leaves end up in landfill sites every year, instead of contributing to our gas grid and food supply. Reducing our cities’ speed limits means shifting the huge vehicles we choose to drive is more efficient, fewer emissions are generated and drivers save money. Most importantly, less energy bouncing around the city makes it more likely people will be encouraged to opt for one of the lower energy options.